I know I was just in chinatown, but somehow I ended up there again the following night. After being at the World Cafe Live, but knowing that I did not want to eat their mediocre food, we started wandering. I wanted to go to Mercato a tiny bit, but there was a wait. So we wandered some more, and ended up in Chinatown. It was a tie between Rangoon and Sang Kee, and for reasons that do not need to be discussed on this here blog, we went with Sang Kee Peking Duck House. Now there was a wait here too, but it was too late, and I was too hungry to walk around anywhere else. It didn’t end up being a very long wait. Lucky for my growling stomach. 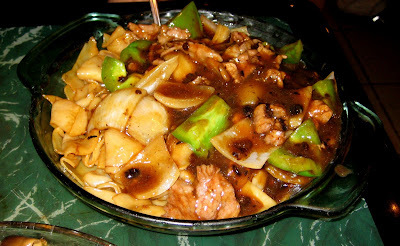 B went with the beef chow fun in black bean sauce. If you like black bean sauce, then you’ll like this. If you don’t, then you should pass. And ho fun noodles? Who doesn’t like ho fun noodles? An extremely thick rice noodle with gravy on it. Oh my word. I ate a bunch of onions out of this, because I love onions and my dish did not have any. So my dish? House Special ho fun noodle. When I was trying to decide what to order, I saw a picture of what I wanted on the menu. I didn’t know what it was so I asked the waiter and he said it was the house special pan fried noodle. I’m not that into the crunchy pan fried noodle, so I asked for ho fun noodles instead and he said sure. Yey! This is everything I want in a dish. Ho fun noodles, some kind of chinese greens, chicken, shrimp, roast pork, and lots and lots of gravy. Everything about this dish is perfect. Seriously, it’s just perfect. Well, maybe not the chicken. I didn’t need that to be in there. I wish it was double the portion of the roast pork instead. I live for Sang Kee’s roast pork. 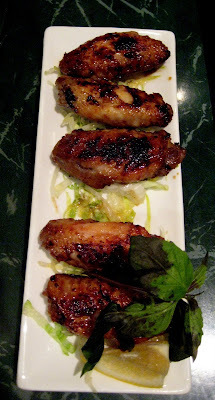 Also not on the menu were these lemongrass wings. B had gotten these before, they weren’t on the menu anymore, nor were they a special, but he asked for them, and he received. It took awhile for them to come out (our waiter warned us), but they were worth the wait. These things were hot and juicy and slippery delicious. These are so much better than any boring buffalo wing. Service was good, nothing special. It’s very factory-esque here. Your food comes out extremely fast. This was my first time eating at the actual Sang Kee. 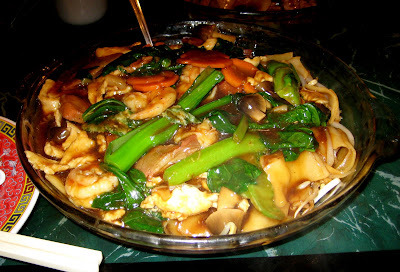 I live near the Sang Kee Asian Bistro and go there all the time. But I think the chinatown one is better.